THEIRS is not a conventional life but then, if it were, Rob Heffernan wouldn't be a world champion. His wife Marian, an international 400m runner who put her own athletics career aside a year ago to manage his, is due a baby at the end of January, so they've had to make some contingency plans. They've converted the attic to help make room for their third child and there's also a 5m x 6m log cabin in the back garden now. It's pretty basic but has electricity, carpet, a corner sofa and a television. She teases him that it is his new "man-cave", and that when she's in the front room with a wailing newborn he'll be in there taking it easy. But, like so much of their unusually dedicated lives, that's an in-joke they can share because only they truly understand what it takes to become the world 50km race walking champion. They're already well used to living in different rooms or countries during those periods when he sleeps in an altitude tent in their Douglas home or goes abroad, for months at a time, to warm-weather training camps. When you're an international athlete who races over a gruelling 31-mile distance, getting the necessary rest and recovery is just as important as the thousands of hours you log up in training. Heffernan does a session each morning and evening and needs to rest -- often sleeping -- in between. Any spare minute is spent with his family but, new baby or not, some things -- like sleep and training -- are non-negotiable. No one can plan exactly for the exigencies of an infant so they accept there'll be times in 2014 when they'll just have to wing it. But, as much as possible, the meticulous planning and relentless daily training routine that is Heffernan's trademark will continue. He may have the sort of cheeky-chappy quick wit and rapport that was a god-send to TV hosts like Jonathan Edwards and Ryan Tubridy after he won his world crown in Moscow last August, but don't let that fool you. Heffernan is not only blessed with the indigenous, scrappy personality that gives Cork folk a head start in all sport, but is also remarkably organised and disciplined. Having finally found his sporting niche and perfected his own training system, he is not about to do that comic wobble-walk off into the sunset now with a pint glass in his hand. "I look at some athletes in Ireland who hit one high and then came back down and I don't want to be one of them. The typical Irish thing, 'oh, your man went on the beer for a year,' or whatever," he explains. It took until his 35th year to make the breakthrough, so he's intent on not becoming a one-hit wonder and firmly believes he can improve further. He wants to add a European title to his world crown in Zurich next summer and also believes he can still be a medal contender at the Rio 2016 Olympics. He knows age is regarded as an impediment in sport but believes his situation is exceptional. He was originally a 20km specialist and it is only four years since he first completed a 50km race. 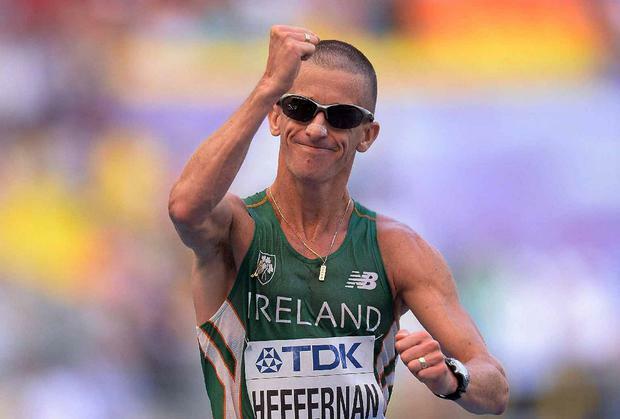 "I'm in a privileged position to say if I knew now what I knew 10 years ago I could have been great," Heffernan says. "But I'm still in that privileged position that I can still improve knowing what I know now. "I'm still hungry for more, and because physically I'm still able to do it, why not go on, and try to back up this year and what I've done in London?" he argues. "Also when I look back over my results, I've always performed relatively well at championships, I just haven't always won a medal. I've just really found my niche over 50km." It was not until hooking up with Polish walks legend Robert Korzeniowski in the mid-noughties that his career really took off and he believes the haphazard nature of his early training may now actually stand to him. "In Ireland, because we don't have professional set-ups from when we're 18 or 19, a lot of our training is sporadic. We also get injured and maybe our bodies are kept younger," Heffernan notes. "I'm doing 100km this week and I'll double that in a few months. That's tough, but if I was training like that at 18 or 19 I would be burned out by 30. "It was amateur at home for so long and when I was younger I had much more to worry about in terms of funding and qualifying standards." He has certainly found his groove in the past three years and is helped by maximum government funding (€40,000 a year) and a sponsored car; but that's not much to rear a family on and he has suffered serious hardship and heartache over the years. In the past decade he has had two hernia operations, the disappointment of finishing 15th at the 2009 World Championships in Berlin (he had been eighth in the Olympics the previous summer) and then finishing fourth in both the 20km and 50km at the 2010 European Championships in Barcelona. His time when finishing fourth in the London Olympics 50km was good enough to have won all but one of the previous gold medals. In the 2010 Europeans, Italy's Alex Schwarzer took silver in the 20km. He was the reigning Olympic 50km champion but is now serving a two-year ban for EPO. When Heffernan was coming down the Mall in London, the last man he overtook was Russia's Sergey Bakulin, a former World Youth and European Junior champion. Bakulin was back racing after serving a two-year ban for EPO in 2008-2010 and, a year ago, was banned for life for a second doping violation. But Heffernan, drug-tested 18 times in the past year, takes an unusually sanguine attitude to the cheats. Some of the Russians, he notes, may be on drugs "but they're fierce hard, hard as nails", he stresses. "Whatever they're on, they're (also) living in (training) camps, with the best support, the best of everything. Doping comes when there's big money and professional teams but, before they get that far, they've brilliant systems in place and that's what we have to concentrate on, getting your system right." He refuses to waste time being bitter, pointing out the great joy and satisfaction he gets from competing and pushing himself to the limit. But even his eternally sunny and wise-cracking disposition was almost defeated by the biggest test in his life in 2011; the sudden death of his mother, with whom he was close. The circumstances were particularly tragic. She was found at the foot of the stairs after an apparent fall and only later did they discover that she had had a heart attack. He was in Daegu, South Korea, at the time, preparing to race in the World Championships and the Irish team manager had to break the news. He cried all the way home with Marian by his side but immediately after the funeral she flew straight back out. He insisted on it because she was part of the Irish 4x400m relay team that was chasing Olympic qualification at the time. That terrible episode alone demonstrates their exceptional dedication. Only rarely do elite athletes get due reward, like the weekend they both enjoyed in Monte Carlo last month, rubbing shoulders with megastars like Usain Bolt at the IAAF's annual gala of champions. Given that Heffernan is 'only' training six days a week at the moment, he was able to take a full day off on the Sunday and was as delighted to get 14 hours of uninterrupted sleep. After becoming only the third Irish athlete to win gold at a World Championships, he enjoyed the acclamation but resumed serious training on November 1. "I know they'll (the opposition) be going out next year thinking, 'we're going to take him'. I love that. There's no animosity, but it's a new challenge, not going in as underdog. You're in there, on top of the pile, and they'll be looking to take me down," he enthuses. Success has brought celebrity status, not all of it wanted. He wasn't a complete innocent, given the attention he attracted after finishing fourth at the 2012 Olympics. "I realised after London that I still had no medal and could have been pulled left, right and centre. But once I'm back training, that's it, and I'm delighted to be back into the routine to be honest. I was sick of all the publicity stuff. "With any job you want to get back to reality. I'm a sportsman. I'm not a TV personality or a politician, I'm an athlete." That fact was harshly underlined by his ill-judged tweet about the Roma people a few months ago. He made a knee-jerk comment on Twitter in response to unfounded allegations of a child kidnapping in Tallaght and was taken aback when other knees jerked equally rapidly in his direction. He was particularly hurt to be called racist, considering he has trained with and befriended athletes of so many nationalities. "It was stupid, I never read all the facts and I threw it out but I apologised and still people are bringing it up to me. I was surprised people were ready to tear me down," he says. "The biggest lesson is that I'm only an ordinary fella from Cork and I need to be more responsible. I'm a public figure now and just can't be throwing out comments like that. "But I'm only human too. People make mistakes and people need to get over it and move on." That Twitter storm taught him an important lesson, but many of his Irish team-mates could learn a lot from Heffernan. Sonia O'Sullivan reckons that some of them are simply not tough enough, a criticism that could never be levelled at the steely Corkman, but Heffernan has a slightly different take on that theory. "It's easy to be tough when you're prepared," he stresses. "If you threw me into a 20km race right now I'm not tough because I'm not ready. "For any athlete it's about preparation and environment. You can throw booklets and plans at them all you like but unless an athlete is willing to live, sleep, eat and train -- with no distractions -- then you're never going to be any good." Heffernan may finally be a world champion but he has never been one for getting above his station and is well able to put things in perspective. August 14, 2013, may have been the greatest race of his career but he actually doesn't believe it was his best performance ever. "In 2006 I was going to be cut from funding. I'd had a double hernia operation and 10 weeks later I had just one opportunity to get an (Olympic) 'A' standard. I went and got it in Copenhagen then. That was just as big an achievement as Moscow. "Last year, after London, I was walking around Cork and you could easily fall into that bubble of thinking you're some kind of superstar. "But I raced in Lugano (Switzerland, in a 20km race) in March and luckily there was no media coverage because I was only 10th and nearly at the end of my rope by the time it was finished. "When I came back from London and everyone was patting me on the back, all I could remember was Lugano! That's good because it keeps you grounded and focused."